There are many great reasons to have your child play independently each day. 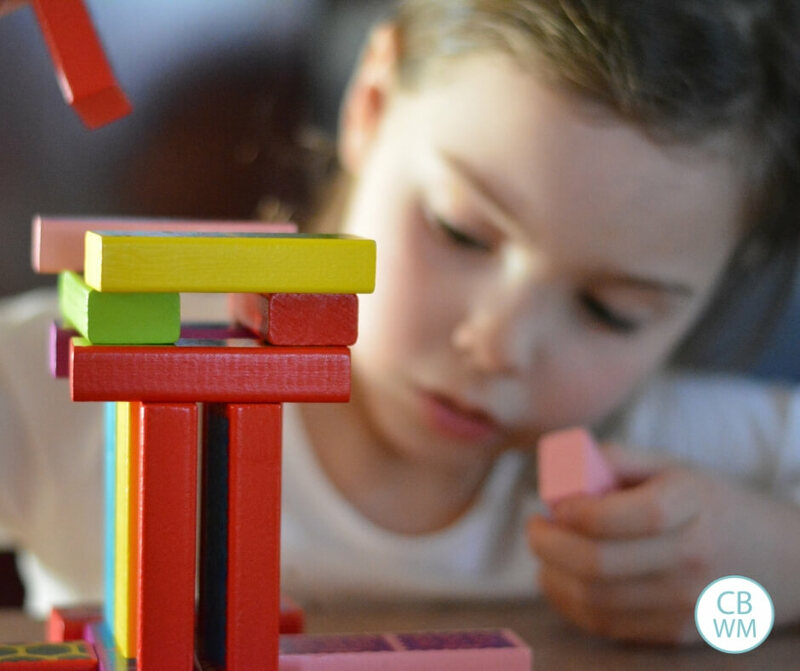 Come find out why independent playtime is so beneficial to your child! I have said it many times, and I will say it many more. 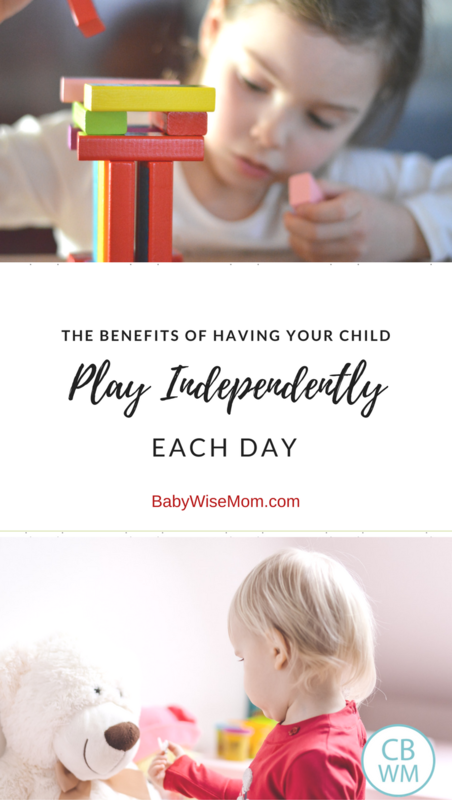 If there were just one principle I could take from Babywise, it would be independent play. The focusing skills and sustained attention span are strikingly apparent. My children will play with one toy for a really long time. Kaitlyn, at not even age 2, will play with one toy longer than it takes the average four year old to go through an entire backpack of toys–twice. Both children are and have always been this way. I get a lot of comments about, especially from women I know who are elementary school teachers. They know the benefit of this ability and are impressed by it in children so young. This is such a nice ability to have when you are out in public. You can bring a few toys to entertain your child, rather than half of the toy room :). If you are a mom who hovers, you will also see many benefits from independent play. I am a mom who hovers. I interfere too much and too quickly. I don’t let the child figure things out on their own. I have gotten a lot better over the years, but I still have to remind myself to hold back. With independent play, my children are able to work on things without mom hovering and fixing all of their difficulties for them. There is also something about independent play that just creates a happier, more obedient child. When Brayden doesn’t get his independent play, he is more emotional and more likely to disobey. One of my best friends also follows Babywise and has a son about 9 months younger than Brayden. We will often get together for playdates, but we both always say we need to do it after independent play so our sons will be on their best behavior. After independent play, we clean up the toys. This has helped my children to see that everything has a place and helps them to know where things go. They also can see the benefits from cleaning up. Things feel more peaceful and relaxing when they are orderly, and I think the children come to see that as they routinely clean up toys. Both of my children will even clean up toys before they get new ones out during independent play at times. Brayden (3.5) will often clean up all of his toys before I go get him (he can read clocks–he knows the times that are pertinent to his life). Beyond all of the benefits for the child, there are benefits for Mom. You don’t need to feel guilty about having benefits. We already know there are great benefits for the child. When the child has independent play, you have time to get things done you need to. It also gives both of you a break from each other. As much as you both love each other, it is good to take breathers. When you as the mom are able to get things done you need to, you can then dedicate one-on-one time to your child fully. You are also more refreshed, less stressed, and able to enjoy your children more. I hope you can see that there are many great benefits to independent play. It can seem like an unlikely skill if your child is older, but you can do it. If your child is a baby, work on it and maintain your consistency. This will not be a skill you live to regret teaching. It is well worth your time and effort. I started late with this and we’re starting gradually with my 13 month old. We currently do 12 minutes twice a day. She’s getting better at it and though I haven’t noticed any huge benefits for her yet, the benefits for me are amazing. She does it while I’m making dinner and I can get so much done in those few minutes while I don’t have to worry about watching her. Thank you for your encouragement to add this to our day! I finally started doing independent playtime with my son when he was 16 mo (18 mo now) and it is wonderful! He loves to go in his room and play and will usually play for an hour and fifteen minutes. When I say, “It is time to go to your room and play,” he is happy and eager for me to get out the toys and then wants me to leave! It is been great for me because I can get so much done. Thanks for continuing to recommend this important skill! I have been wondering where to post this suggestion and question, and this feed just makes sense. First of all, I love independent playtime! My twins are only 6 months old, but they have had independent time since they were about a month old. They are so good at it, and they really seem to enjoy it.Since they don’t crawl yet I have them do their playtime in their room with a play gym (a mat with a toy bar that hangs over it). I love these things. They were a gift from my father-in-law, and I’m so glad we have them. They are really bright and colorful, and they zip up to store in a really small space. We got them when my boys were 3 months old, and they still love to play with them (I switch the boys between the two each day since they have different toys). I would really recommend them to anyone who doesn’t have a lot of money or space but wants a way for their little one to enjoy independent playtime.Both my boys will play happily for 30 minutes which means I can unload and load the dishwasher everyday! (I was a first grade teacher for three years before I had my boys, and some of my 6 and 7 year old students couldn’t concentrate on something for 30 minutes!) I love to listen outside their room to the happy sounds they make, especially when they figure out how to start the music on gym. :)I know my boys will eventually learn to crawl and need a safe place to continue independent playtime. The problem is we don’t have a lot of room in our apartment, and we only have one play yard. I want them to still have their independent time at the same time so I can get my “loud chores” done. Would it be okay for them to play in their cribs, or would that confuse them when it was time for naps? Thanks again for this great blog! How would you recommend starting late? I did independent play with my 2 1/2 year old when he was a baby, but it slowly disappeared. He still plays fairly well on his own, but lately wants me close by. That may have to do with the new baby in the house, but I’d like to get independent play going. I’m just not sure how to start with one so old. Thanks. Sorry, one more question. I just read the 7 independent playtime posts. For room time would you recommend determining what your kid plays with and having that be the only thing in the room? Or offer them to choose something (or a couple things) and limit it? Or do you keep a store of toys in Brayden’s room? Thanks again! My girls are now eight and six years old, but I instituted independent play when they were very young and found it to be extremely helpful. To this day, they both play well alone and can entertain themselves for a good period of time. 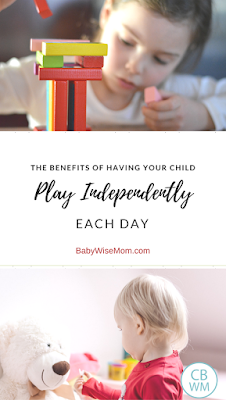 I can identify with being a mother who “hovers” and am glad I used Babywise principles to help my children develop in the area of independent play. You are welcome Jennifer! I remember that feeling. I was amazed at what I could do with those extra 15 minutes at first! Kristi,Thanks for all of your suggestions!I think it is totally fine to have one of them in the crib each day. I would be sure to move the matress to its lowest level for safety. Then you can just be sure to have a different “routine” leading up to naps/bed vs. independent play, which should be no problem. Kaitlyn took naps in the playard every day, and also had independent play in the playard every day. She never had a problem. Kristin, My ideas for starting late are outlined in the Independent Play post. Did you see that one?My kids have independent play in their rooms. Brayden’s room has most of the toys we own in it. We have most of the toys out of sight, so he doesn’t visually see every toy, but there are in there and he knows it. We have the toys in cupboards. It is hard to explain, but they are cupboards. I will open a cupboard or two and rotate it. Some days I open nothing. We always get his trucks out every day. So he has access to all of his toys, but doesn’t play with all of them every day (or realy even a portion).Kaitlyn’s is more directed by me. She doesn’t have a lot of toys in her room. I will get one or two toys from Brayden’s room and put them in her room for the day. I rotate through them. Then she has some other toys in there. I always give her several books because she just loves to sit and look at books. Thanks for your added thoughts Tracey! It is always good to hear of the success of others. I'm sure you have posted this somewhere but I'm having issues finding it :o) Do you have suggestions on how to incorporate independent playtime for parents who both work full time? I feel like our time is so limited as it is together – coming home by 5/5:30, dinner 6-6:30, some family time together, then bath, bed by 7:30. Not to mention the nights we have activities like swim. Weekends are definitely an option, but is indep playtime 2x/week 'consistent' enough? Weekends being full of things to do as well, can the time shift as long as the 'mommy decides' concept is in place?